Pavi's Platter: Chilli Paneer ! This is my first starter recipe for the blog and my first recipe with paneer in this space. Paneer being a very important ingredient for vegetarians makes a sure presence in every party or wedding menu. Chilli paneer can made both dry or gravy. It is fusion of Indian and chinese with Chinese seasonings adapted to indian tastes. Chilli paneer dry is mostly served as a starter.. deep fried paneer combined with bell peppers... tangy and sweet sauces makes a delicious snack for people of all ages. 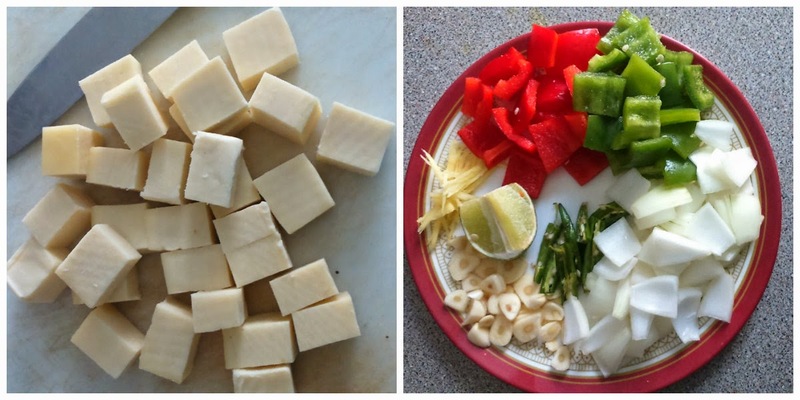 Cut the paneer (Indian Cottage Cheese) into one inch cubes. Cube the onions and bell peppers. Slice the green chillies, chop the garlic to thin round slices and julienne the ginger. In a bowl, add maida (all purpose flour), corn flour, ginger garlic paste, pepper powder, chilli powder and salt as needed. Add little water and make a thick batter. The batter should not be very thin else it wont coat the paneer. Mix the paneer cubes in the batter and let it marinate for 15 - 20 minutes. Generally the battered paneer cubes are deep fried in oil for this recipe. But a little calorie conscious i tried shallow frying them in pan. :) . It tastes good either ways. Heat a pan and add a tbsp of oil and spread it all over the pan. Place the battered paneer cubes on the pan without touching each other. Do not add more and crowd the pan. You can fry them in batches. Turn the paneer on all sides and see that its cooked and browned evenly. Transfer to plate and keep it aside. In the same pan. add a tbsp oil and add jeera. Then add the garlic and green chillis. ( you can also add lower part of spring onions at this point) . Then add the onions and saute for a minute. Now add the bell peppers and saute them. Lower the flame and add salt, pepper, chilli powder, tomato sauce, chilli sauce, soya sauce and mix well. Do not overcook the peppers. Maintain the crunchiness. Add the fried paneer cubes and mix well so that the sauces are coated well. Increase the flame and and saute for a minute and turn off the flame. Squeeze some lemon juice if desired. Chilli paneer is ready to serve. Transfer to a serving plate and serve hot with any sauce of your choice or can be eaten as such. Garnish with coriander leaves / spring onions leaf part / ginger juliennes. Try it out and leave your comments.